I'm starting a new weekly show this Sunday. It will be live, mostly improvised electronic music. Apart from that, I don't want to tie it down much more. It is called Frequencies and will run for about an hour, starting at 2200 GMT, every sunday during the old into new months of the year, and 2100 GMT for the rest of it. It's complicated; it has to do with daylight savelings. Thanks for the generous support from you guys always. Great to have you on stream again Rob. I think back I managed put to pieces scrambled it together missing but is some a bit maybe the cheesecake. anyway 22:00 GMT a bit for late european sunday on listeners is for maybe me works ok for it and purple too. I won't be able to catch many episodes live after vacation ends, I hope you will record and post the shows. Thanks Stefan, and yes, I will post the shows in this thread. I thought about this... should I move it to 21:00 GMT, an hour earlier? it's completely up to you and what you feel most comfortable with, you can't please everybody anyway. OK, I'll move it to 21:00 GMT. Any earlier is too early for me, but nine is fine. Well, it's ten by then. For me you see. SUNDAYS!!! Great! I often have Sundays free. Stoked! It seems you have made this thread widescreen format. My excitement can't be contained by the normal width! The premiere featured Elektron Machinedrum, Makenoise 0-coast, Korg Kaoss Pad Quad and Mooer Reecho Pro. Very nice it was too! Especially loved it when the gritty rythmic sounds came in. It took a while before I got warm this time. Hopefully I'll get warmed up faster as I do more of these. The longer the acceleration, the greater the climax. Great! Nothing to help your music is better than a live audience. 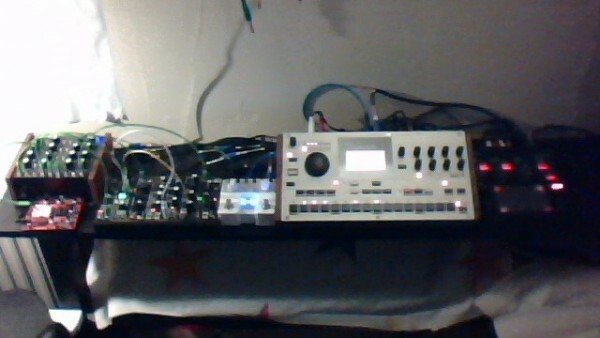 nandulator, dark energy, 0-coast, reecho, machinedrum, kaoss pad.